Hello and welcome to Best of the Tableau Web. It’s a big list this month for two reasons: first of all, we skipped a month. Second, lots of you responded to our call for new blogs to follow last month. Thank you to everyone who added their blog to the list. I’ve updated the list of blogs I’m following. Keep the ideas coming. Your posts make my commute more fun! 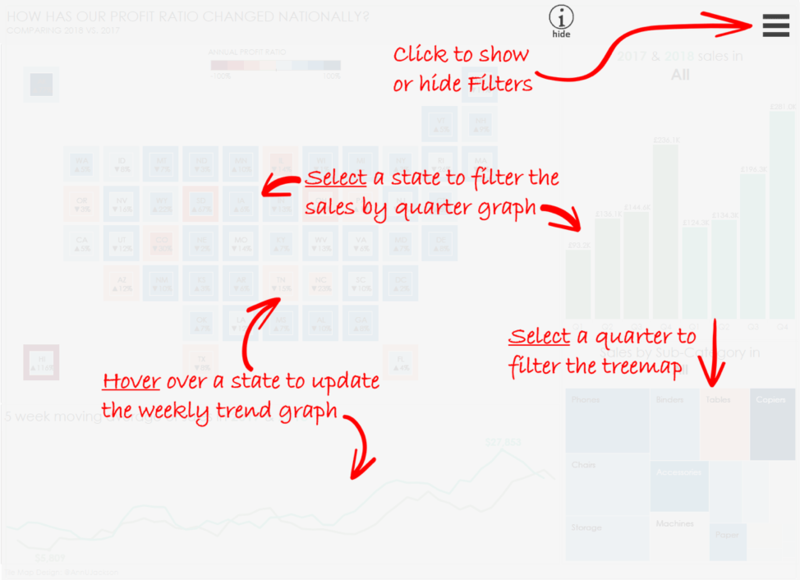 A post that caught my eye from the new blogs was by Marc Reid, who’s been playing with the Tableau 2019.2 beta. A new feature in the beta allows you to show or hide layout containers with a toggle button. We designed that feature primarily to allow people to tidy up dashboards by hiding filters when they aren’t necessary. But Marc took the feature and came up with a fantastic idea: toggle a help screen on and off to help new or occasional users. It’s always a pleasure to see the feature being used in creative ways. Another shout out goes to Rachel Kurtz at Interworks who took another new feature, Set Actions, and shows a way of building sets across multiple views. Her primary use case is geographic data, but this could be applied to many more areas. With that, here’s our list. In the meantime - keep on blogging! Kevin Flerlage Who’s Afraid of the Big Bad Radial Bar Chart? Timo Tautenhahn How to write back data to Microsoft SQL Server, MySQL or SAP HANA? Ritehesh Makkena How to write back data to SAP HANA?